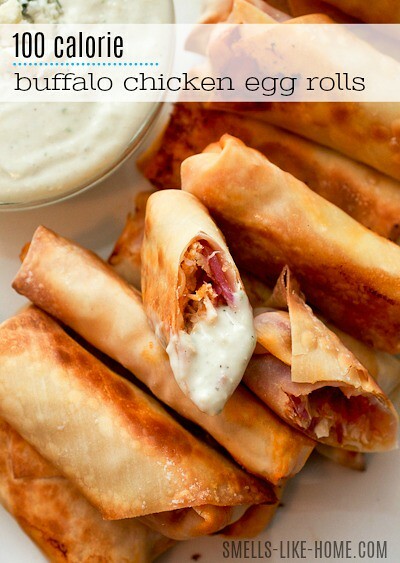 Buffalo chicken egg rolls – A super healthy buffalo chicken snack alternative that comes in at only 100 calories! Perfect for your game days, movie nights, or lip sync parties! Right on the heels of that killer healthier buffalo chicken salad (with creamy avocado ranch dressing), I’m throwing another buffalo chicken recipe at you. I warned you: it’s been a craving for at least a few weeks now. Or has it been at least month already? Who knows. I’ve shocked myself that I’ve been able to persuade myself into putting a lighter spin on buffalo chicken when my natural instinct is to gravitate towards breaded and fried…well, anything. But it’s meals like this one that make me feel like I don’t need to absolutely kill myself at the gym for. You’re going to use some shredded roast chicken (roast your own or use a rotisserie chicken from the grocery store) and roll it around in some hot sauce. Then add some shredded cheddar or crumbled blue cheese, if you so choose, and some shredded cabbage and then fold everything up into some egg roll wrappers. Clearly, there’s a lot of shredded food going on here. You could also throw some chopped celery in there but since Kyle is allergic to it, I obviously opted not to. Yes, that’s right – no sloppy frying going on here!! They turn out crispy-crunchy and way, way healthier than frying (like only about 100 calories each, healthy). 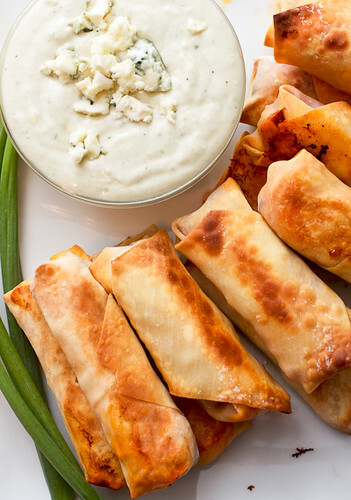 These buffalo chicken egg rolls are seriously perfect! And whether you eat a couple for a light lunch, for dinner with a salad, or serve them for a snack at your next party, you absolutely cannot go wrong. Because really. 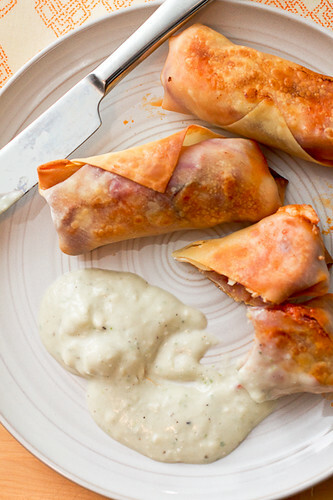 How could you EVER go wrong with eating egg rolls? More egg rolls from my favorite sites! 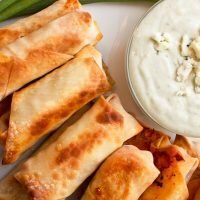 These egg rolls are a super healthy buffalo chicken snack alternative that comes in at only 100 calories! 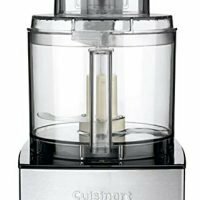 Perfect for your game days, movie nights, game nights, or whenever that buffalo chicken craving hits! In a large bowl, toss the chicken with ½ cup of hot sauce, adding up to a total of ⅔ cup if the chicken seems to soak up the sauce really quickly – it probably will. Lay an egg roll wrapper out on a clean work surface with one corner facing you and spread about 1 tablespoon cabbage or coleslaw horizontally across the wrapper. Top with 2 tablespoons (or a small cookie scoop) of chicken then 1 tablespoon of cheese. To roll the egg roll, pull the corner closest to you up towards the center of the filling and wrap it under the filling. Fold in the right and left corners, sealing the two with a dab of water. Roll the egg roll away from you, while gently snuggling the egg roll into itself to keep it from falling apart. Be careful not to tug too hard anywhere – the wrapper can tear easily. Seal the final corner onto the egg roll with another dab of water and place the egg roll seam-side down on the prepared baking sheet. Repeat with 11 remaining wrappers. 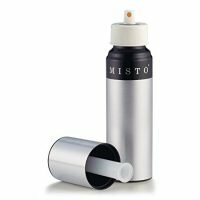 You’ll probably end up with quite a few wrappers left over – they can be tucked inside a zip-top bag and frozen on a flat surface. Thaw in the fridge before using again. Lightly spray the tops of the egg rolls with cooking spray and bake for 12 to 17 minutes, flipping over halfway through, until golden brown and crispy. Serve with blue cheese or ranch dressing. I haven’t tried this yet, but I’m sure these egg rolls will freeze well! 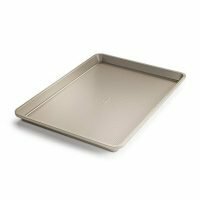 Just assemble and freeze a bunch on a parchment-lined baking sheet before you bake them. Once they are frozen, toss them in a zip-top bag and freeze until you need them. Bake the egg rolls directly from the freezer in a preheated 400° F oven, adding 4 to 5 minutes to the baking time. adapted from Can You Stay for Dinner? Wow. I didn’t think an egg roll could get any more awesome, but it has! This looks delicious! I’ve been craving some buffalo chicken lately and this looks like just what I needed! I am not sure how I stumbled across your blog but I am so glad I did!! Your recipes all look amazing and I may have gone a little “pin”crazy 🙂 Can’t wait to try some of them soon! Have you tried freezing them yet? I’m trying to make as much as I can in advance for a baby shower im hosting, but I don’t want to sacrifice quality. These just look tooo yummy not to try! I haven’t but I’m sure they would be fine. Bake them right from the freezer without letting them thaw first. Glad I found you!!! 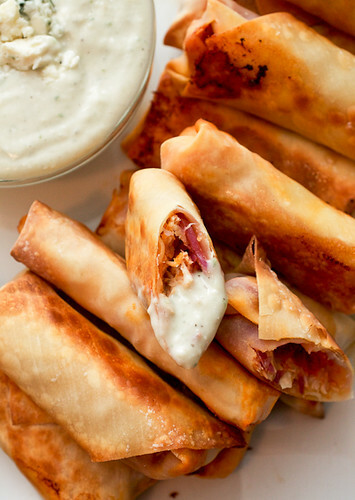 I saw these yummy looking egg rolls on Pintrest..my new obsession…lol. Maple buffalo sounds amaaaaazing! I might have to try something like that soon. Will let you know how it goes! I want to make these for a potluck for work, do you think i could bake them the morning of the potluck and then put them in the crockpot to keep them warm or do you have any suggestions to warming them up? Microwave? ?